Hogsback, your Eastern Cape mountain escape! Open 24 / 7 365 Days a year! The campsite, with a view of the magnificent “Hogs”, offers a peaceful setting for you to relax and unwind. 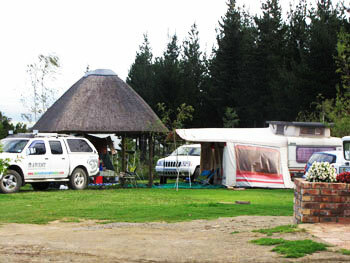 Our camping and caravanning sites are all situated on soft lawn with partial shade. Powerpoints are available at selected sites and there is a conveniently situated ablution facility. Children are welcome to play on the wooden jungle gym and the swing set. The surrounding gardens boasts a wonderful variety of flowers and plants which attracts many types of birds and butterflies some of which are unique to the area. All these walks can be reached from Swallowtail Country Estate. You will only know how beautiful it is when you have experienced it! Dear Campers. Why not buy one and try it out at Swallowtail Country Estate. We still do have sites available over the holiday period. See you all! You will not regret coming. You are welcome at Swallowtail! This is the life at Swallowtail!